My grandfather, William (Bill) Kerr Murphy, passed away Wednesday evening, November 25, 2015. He had struggled with pneumonia the last several years, but this last bout was too much for his heart and lungs to fight off. Thank you to all who have expressed condolences. Grandpa was born in Pulaski County, Indiana on May 6, 1914. He was proceeded in death by his wife of 77 years, my grandmother, Wilma (100). He is survived by one daughter Jacquelin (Larry) Berger, two grandsons, Kevin (Rebecca) Berger and Korey Berger, one granddaughter, Kristine Eisenhour, and two great grandchildren, Kyanne and Kameron Eisenhour. 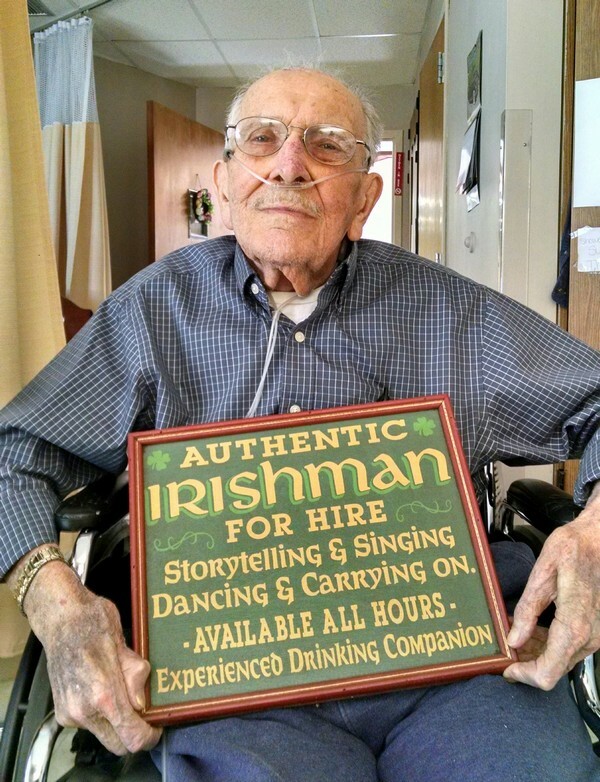 At 101, he had led a long and good life. He graduated from Winamac High School where he met his wife Wilma (Wolfe). They were married on his birthday (so he couldn’t forget their anniversary) in 1935. He taught school for a time and joked about seeing some of the students he had taught in the nursing home with him! During WWII, he worked as a radio operator at Kingsbury Munitions Plant in Kingsford Heights, Indiana. That job gave him deferment from military duty, but he later gave up that deferment to join the Navy. He ran the mechanics shop in Puerto Rico repairing diesel engines on many ships that had been damaged in the war effort by U-boats. His wife got seriously ill and he was allowed to return home to care for his family with an early discharge. He ran the Shell Station in Winamac for several years before continuing his education to become an auditor doing municipal audits for the Indiana State Board of Accounts. While living in Winamac, he served on the Town Board, including a stint as President. Nearing retirement, he moved to Culver and had a home on the channels in Venetian Village, as well as a winter home in Lakeland, FL. Grandpa was a member of the Winamac Masonic Lodge and of the Scottish Rite for more than 50 years. He was also a lifetime member of the VFW. I have a lot of good memories of all of my grandparents (many of which I shared here) and my Grandpa Murphy in-particular. Grandpa taught me to shoot and to fish. He took me along on Saturday mornings when he helped my grandmother’s uncle down in Monticello. He taught me that doing that good deed, and the hard work involved, was ample excuse for a couple of morning doughnuts! Grandpa loved to collect antiques and he would spend hours stripping and refinishing those pieces. I spent many Saturdays with him as he worked on these. For most of that time I was too young to help, but I was there to see the time and effort that went into them. It was always impressive to see the progress as the pieces moved through the process of stripping, staining, and coat after coat after coat of varnish until the finish was like glass. We have several of those in our home including a secretary, a teacher’s desk, and a lawyer’s conference table. Becky was at an auction which my grandparents also attended. She had bid on a secretary, but it quickly went out of her budget. They consoled her afterwards and told her that the secretary he had finished was hers. The teacher’s desk is one of the old ones with the hinged top with storage underneath. It has a doweled fence around the top at the front that he painstakingly rebuilt. The lawyer’s table is now our dining room table. He found it in the basement of a courthouse when he was doing an audit. They were going to throw it out, but he got a janitor to help him carry it out of the basement and strap it to the top of his Pinto hatchback! I can only imagine what that looked like going down the road. He said that the knot tying he learned in the Navy served him well that day. Most of his antique refinishing was done in his garage when my grandparents lived in Winamac. They had a Wheel Horse riding mower that I drove around the yard when I wasn’t helping in the garage. A few years ago I went by the old house and couldn’t believe how the yard and house had shrunk! 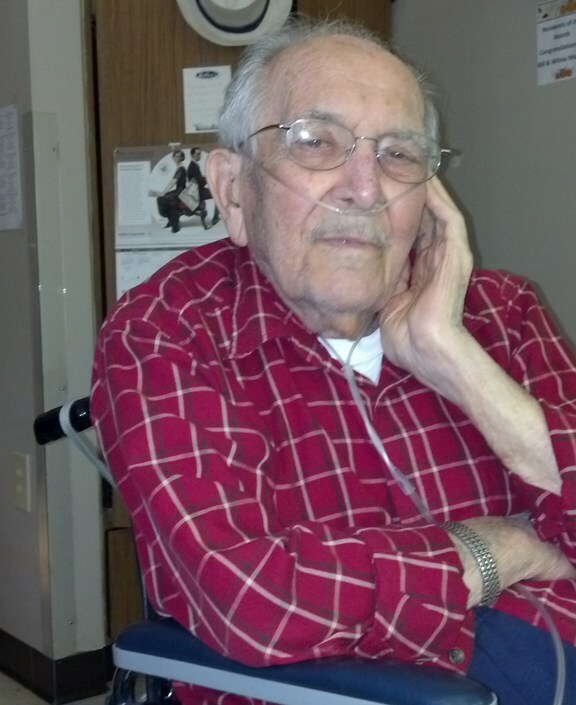 During his final years at the nursing home, I would make a point to visit him several times each week. Sometimes only two times, but sometimes every week night after work. I would try and get there before 6:00 pm to see him down to supper. I would listen as he told me about his day and would share what I was doing. Often I would leave there to go to a Town Council, Plan Commission or other meeting and he would encourage me to, “Keep them in line!”. Grandpa was always fond of Colloquialisms… but he tended to shorten them. Having grown up with them, I was familar with most of the ones he used, but it was always funny to see him use one in front of the young aides at the nursing home. Not that they would have recognized them anyway, but when he shortened them, they made even less sense. 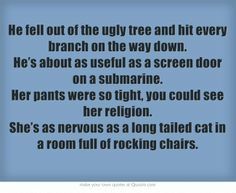 One of the common ones he would use was, “I’m nervous as a cat!”, which was a shortened version of “I’m nervous as a long-tailed cat in a room full of rocking chairs!”. Not quite the same thing without the second part of the sentence, but it made sense to him and I knew what he meant… Some of the others were shortened to eliminate the four-letter-words or other imagery that were part of the punchline. For that reason I’ll skip quoting them here, but again, without the entire saying, they didn’t make a lot of sense to the uninitiated. Grandpa was blessed with a long life and good health and good humor for most of it. He celebrated his 100th birthday with a party at the Culver VFW where he was doted on by friends, family and scores of acquaintances. Throughout his life, Grandpa never knew a stranger and nearly everyone that met him left as a friend. The Director of the State Board of Accounts, as well as several field examiners, attended the event and presented Grandpa with a certificate signed by the governor. Grandpa joked that as examiners they were just there to make sure they should still be sending the pension check. Grandpa spent his last days in Miller’s Merry Manor in Culver where he had many residents and staff that he counted as friends. Visitation will be noon to 2:00 pm on Monday, December 7, 2015 at the Wesley United Methodist Church in Culver with services to follow immediately in the Church at 2:00 pm. In lieu of flowers, memorials may be given to the Culver VFW or the Scottish Rite. The Odom Funeral Home in Culver is in charge of the arrangements. You were never too busy to talk to us, stop in to check out what our "problem" was-----and follow through on whatever you promised you would do for us. And on time. It doesn't get better than that.